Knowing from the beginning of World War II that the surprise attack on American territory at Pearl Harbor required a quick answer in kind, President Franklin Roosevelt consistently had been pressuring the U.S. military to somehow strike back at the Japanese home island. The plan finally settled upon was to strike the Japanese capital and other cities with land based B-25 medium Army bombers from a aircraft carrier. 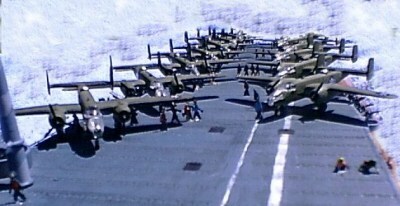 No one knew for sure if a B-25 with full crew, bomb load and a mandatory extra fuel tank could actually get into the air from a crowded carrier deck. It was a far fetched, near suicidal plan, but America needed a victory fast. 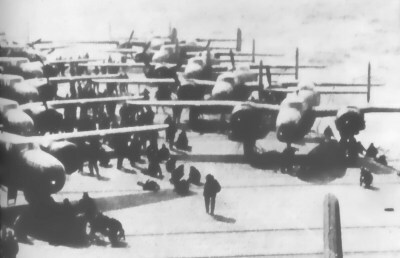 Though the Doolittle Raid was later claimed by Japanese propagandists to be the “Do-nothing” raid because it resulted in relatively minor damage to the Japanese cities bombed, it has gone down in history not only as a remarkable story of courage and badly needed morale boost but as the motivating factor that would lead to the turning point of the war in the Pacific -- the Battle of Midway. It also, by the way, makes a great subject for modeling. 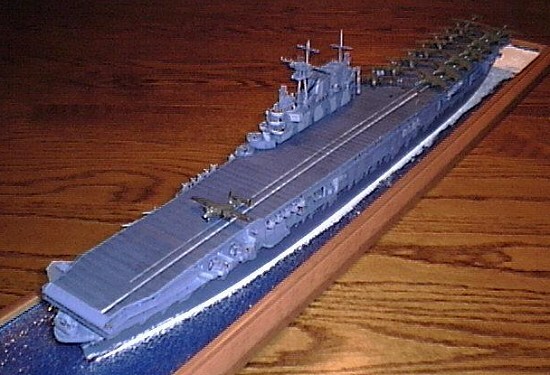 As someone who just got back into modeling after a 20 year hiatus and had last built a 20th Century warship back in the 20th Century when he was around 12, my reaction when I opened the box was: “Boy is 1/350th a big scale for an aircraft carrier (over 28” long)!” The shelf my wife has granted [er, . . . tolerated] me to use for model display is now far too small. On the other hand, boy is this scale small for all the airplanes (my project has 16 B-25s [18 parts each! ], and one each of a token F4f, Devastator and Dauntless) and men (103) that I have chosen to build, paint and put on! My fingers are too big, my vision too dull and my patience too short! Welcome to modeling in the 21st Century! The kit provides only enough aircraft parts to make two B-25s, two fighters, two dive bombers/scouts and two torpedo bombers. 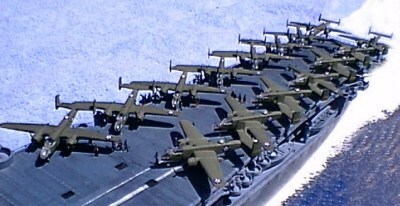 Hence, because I wanted to do the Doolittle raid, a supplemental kit containing a set of 10 extra B-25 parts are not enough – I needed two sets -- which left me with many more extra B-25’s than I needed to cannibalize for all the microscopic parts that disappeared when they slipped out of my fingers. There were few decals needed for the ship, though the ship’s name on the stern seems to have been in the wrong color according to dry dock pictures in Warship Pictorial # 9 at p. 45 (white instead of back). The decals for the planes were good for the carrier based aircraft, but a major headache for the B-25’s. This is because only some of the serial numbers reflected those on the actual planes – while the majority were made up numbers! You would expect a kit designer either to not care and make them all up, or try to do everything authentically (like Accurate Miniatures kits). But why did the Trumpeter designers put in the effort to be right on some serial numbers (e.g., Doolittle’s, Ted Lawson’s) and simply pretend about the others? No photo-etch parts are included in the kit and in this scale they are needed. Hence I used a set from Tom’s Model Works which were great and, though not as detailed as others that I lusted after, they were far more reasonable in cost – especially as the total costs of this massive project (for me anyway) added up. For a novice at massive ship models with massive detail and photo-etch, construction of the ship itself was amazingly smooth. Far less filling and sanding than I expected. The parts fit well and the pictures only instructions were quite helpful. Being inexperienced with photo etch railing, Tom’s instructions took some time to get used to but I finally figured it out and they looked good after I got the hang of how to do it – however there were no instructions telling me what to do with all that railing so I just guessed from photos and did my best. (Like working on a car, its bothersome when you have some parts left over!) Now for the complaints: the designers again made some odd choices. Much internet comment was given to the apparently inaccurate bow shape (to be honest, I could not tell), but nowhere have I seen anyone complain about some real obvious design errors. They range from relatively minor mistakes like the mislocation of the deck crane (which, if not changed to where photos show it should be, would in real life be an obstacle to flight operations!). More obvious, the designers for some reason added a second yard arm to the island’s aft mast – which every photo of the Hornet and Yorktown class ship shows only has one. This becomes obvious when trying to rig the masts which, again, must be done from photo research in that NO guidance is provided. Besides the above noted necessary changes for accuracy, I found a fortuitous mention in “The Ship That Held The Line,” at p. 70, that a hanger deck door was open at the time Doolittle took off. Because all the Hornet’s ship based planes were in the hanger at the time, an open hanger deck door would allow me to show off an example of each kind of the three types of Navy plane. However, the only pictures and films taken of the ship during launch seem to show the starboard side and that the roller doors were closed on that side (understandable because of the storm they were in at the time). Hence, I chose to open the roller doors on the port side only. A hot exacto knife did the trick to cut away the molded in place doors. 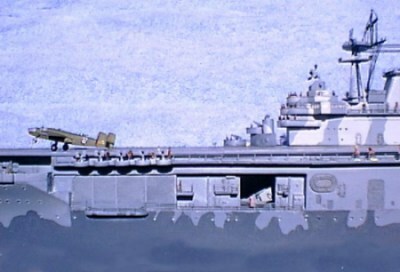 In that the kit provided only two of each type of carrier plane and little of the ship’s interior can be seen away from the doorways, things worked out fine. The airplanes are amazingly accurate for their scale, but when you have to build 16 of the same kind the joy evaporates over time and I had to fight the urge just to slap the little suckers together! However, patience, patience, patience and a purposeful decision to act in shifts over time was my salvation. The same is true for the 1/350th scale photo-etch sailors from Tom’s Model works. Another hundred or two would have been great, but there are limits to my now Zen-like purposeful patience! However, the extra ships railings that I did not know what to with from Tom’s Model Works were perfect for use -- after being cut down -- as double machine guns for B-25’s. A missing touch that I can’t believe the after market folks seem to have so far overlooked. 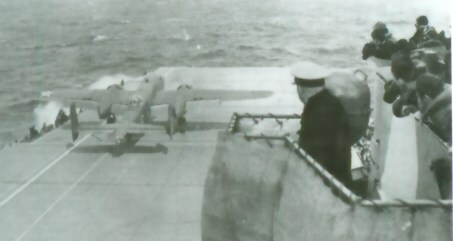 Finally came the “spotting” of the bombers on the deck. After studying photos and reading accounts, it is clear at the time of the launch that the tails of the last two Mitchells extended precariously over the stern of the ship while the rest were cheek to jowl on the deck in two lines at an angles facing each other. (Indeed, DeShazer’s B-25 #16 was discovered at take off to have a hole in its Plexiglas nose -- making his bombing duties over the city of Nagoya exceedingly unpleasant with a couple hundred mile an hour wind in his face). The single item that was most time consuming however was dealing with the B-25 decal problem. I could find no 1/350th scale after market decals of the Doolittle planes. My only solution was to buy Accurate Miniature’s 1/48 B-25B model that has a wonderful set of decals containing markings for EVERY ONE of the 16 planes – including the way cool nose art for those planes that historians think had them! Only problem of course is that they are WAY too large a scale. Hence, much time was spent scanning the decals into my computer, reducing them to the proper miniature scale and laboriously using Corel Print Office software to outline them to be visible at 1/350th scale. Its not as sharp as properly designed 1/350th scale decals but better in my mind than having phony serial numbers -- plus I got to put on some really microscopic nose art. Someone PLEASE fill this need! The Accurate Miniatures B-25 kit’s painting instructions also came in handy – not only telling me where to paint what, but giving me the exact paint numbers from various manufacturers that would be appropriate. (Why doesn’t Accurate Miniatures do ships?) I chose the Model Masters Acrylic Olive Drab (Tes4728) and Natural Grey (Tes4757). The rest (e.g. leading edge de-icers, prop warning stripe) was hand painted with artists acrylic tube paint. Finally because of the heavy seas, and I think some defective paint, the real Hornet came back from the raid with serious chipped paint at the waterline on the bow. See e.g. Warship Pictorial #9 at pp. 56 & 57. Because the underlying molded plastic seems to be similar to the color showing under the chipped paint in the photos, I simply scratched the paint off like the real thing and I think it passes. 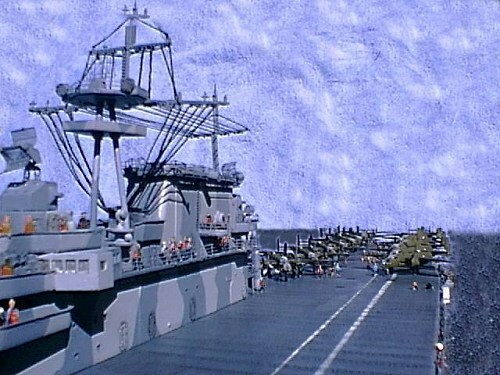 Though I found a reference in “The Ship That Held The Line” and in “The First Heroes” to the words “REMEMBER PEARL HARBOR” being painted on the Hornet’s stack (which would be a really nice touch to add to the model), I could find no pictures of the same and the scholars and vets (who were actually there) graciously responded to e-mails sent via the Battle Of Midway Roundtable (lodinet.com/rruss/midway/index.html) that it simply was not there. Though disappointing, that settled the issue for me. Likewise, help from Doolittle discussion groups (e.g. doolittleraider.com/ and doolittleraid.com/) pointed out the prominent presence of non-skid squares on the flight deck that can clearly be seen in the photos of the launch, but for which I have found no other reference. Modeling in the 21st Century does have some advantages apparently. Finally, the question I seldom see discussed: what the heck do I do with it when its finished so that it can be seen but not destroyed by dust fixated housekeepers and curious children? I still have “issues” from childhood memories of coming home waiting to learn of the latest in the slow attrition of my models from my mother’s efforts to dust “Danny’s models.” Decades later, I’ve learned to protect my other more workable size models from my wife and children by using cheap car model display cases. With a little creativity, you can make some interesting (and dust proof) mini dioramas. 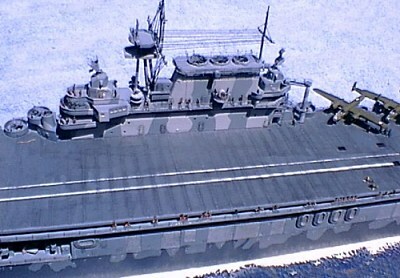 But what do you do with a 28 inch aircraft carrier with fragile 1/350th scale planes in precarious positions on its deck? My solution: buy a baseball bat memorabilia case -- a bit long and a tad narrow, but with some modification and building the Hornet in a waterline version, it just fit. 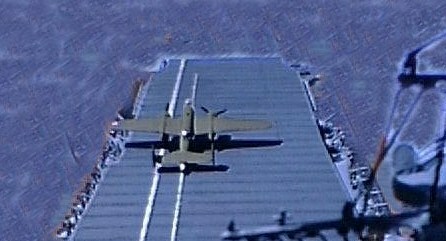 However a carrier launching planes while steaming through a nice wood stained base just would not look right. So, with some advice from a local hobby store, I painted the base dark blue and placed a cut piece of plastic fluorescent light cover (easily obtained from a hardware store) on top -- creating a great rippled sea look. I then used white silicon from a caulking gun for the wake (as suggested in “How to Build Dioramas,” at p. 90) and was done. Thereafter I took some pictures in by backyard and realized it just did not look right with green (ok, there’s a lot of brown in there too) grass in the background. Accordingly, I manipulated the background with Adobe Photo Shop software. All I had to do was repeatedly use the “clone” feature on an area from the “sea” base to create a digital “ocean” for my ship to sail over rather than the grass. Likewise, an old blue towel placed in the background allowed me to create a sky by the same “cloning” feature. Now if I could only figure a way to digitally manipulate my ship to cover up all the mistakes I know I made in its construction! In that even an unsophisticated and retro modeler like me could make something presentable speaks volumes about the Hornet’s quality as a kit. Further, though sometimes irritating, the little historical inaccuracies that I fell across were kind of satisfying finding and correcting. If I could complete it, it certainly is not beyond the average modeler. However, you definitely have to do it as a long term project and not as a short term fling. As the phantom voice said to the hero in the movie and book “Field of Dreams“ -- “GO THE DISTANCE.” I also would plead, PLEASE do your research -- the story of the Doolittle Raid, the USS Hornet and the brave men involved more than deserve your study and will give meaning to what you build.